What do you think about the planned NHS reorganisation? The government is consulting on its white paper and the MHF will be taking part. First we want to know what you think. Click here to complete our survey. 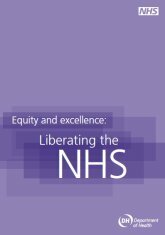 This reorganisation will come out of the government's health white paper, 'Equity and excellence: Liberating the NHS', published last month. The Forum has introduced the issues around the white paper, you can still read New NHS commissioning board will address inequalities. Other organisations and publications have also commented on different aspects of the plans, an article in the BMJ suggested that the NHS reorganisation could cost £3 billion. The government plans to publish a white paper on public health later this year, but there are still aspects of this white paper that will impact on public health, for example the idea of giving GPs powers and the budget to commisson some public health services. Whatever you think, do take a minute to complete our survey. Deadline: end of September.